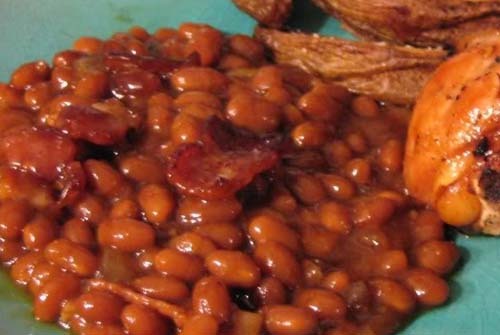 Something easy to make and filling to get me through the day is baked beans. I add bacon in it because I love bacon. Also worth noting is that beans are healthy for you since they are a fantastic source of protein and fiber. Preparation for the meal is simple but takes over 1 hour to cook. So I plan ahead. Preheat oven to 350 degrees. Cook the bacon till crisp in a frying pan, then crumble. Mix all ingredients, including the crumbled bacon, thoroughly in a large bowl. Then pour ingredients into a baking dish. Bake for 1 1/14 hours. Serve and enjoy.